When most people say they are moving house they call in a removalist to pack and/ load boxes of personal possessions and household furniture onto a truck for transport to their new abode. 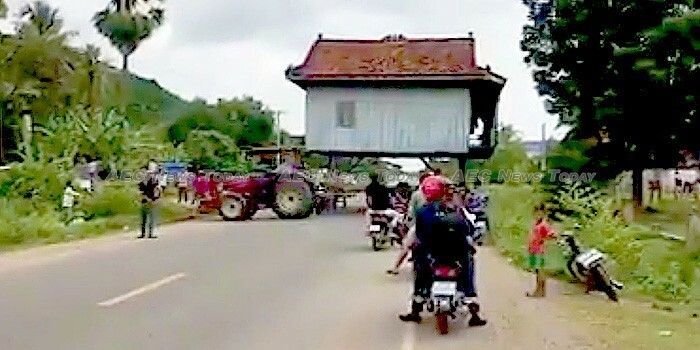 In Cambodia, moving house does not necessarily mean the same thing. In the video above a team of workers can be seen scurrying around a house raised on wheeled scaffolding, blocking half of National Road Number 3 in Kampot Province, southwest Cambodia. Enthralled local residents and road users watch on, waiting to pass the obstruction. While odd to westerners, the practice is not so uncommon in Cambodia, where land sales don’t necessarily include the structures built on it, where people build a house on rented land, or where the owner just decides he/ or she wants to wake up to a different view outside their bedroom window each morning. As with many things that occur in Cambodia, it’s not just a matter of laboriously jacking a house up off the ground (off its stilts) and moving house. There are certain traditions and customs to be observed in the process, including having a woman or child from the house being moved sit in the center of the structure while the house moving is occurring. This, of course, is to appease the house spirits and bring good luck to those who stay with the house. It is not known how far the house in the video above was being moved, or what condition it was in when it arrived at its new location, but moving house in Cambodia — and the value of bricks and mortar security — just took on an entirely new meaning. Compared to the video below though, we can’t help feeling that the house moving team in the video above appear to have had it somewhat easy.